October 2, 1950 was a big day for kids wearing yellow shirts with black patterns on them. It was the day that Charlie Brown debuted in a classic, four-panel comic strip printed in seven newspapers. In the time since, the character and his friends have become household names, catapulting Charles M. Schulz into beloved status. This October, KaBOOM!, Charles M. Schulz Creative Associates and Peanuts Worldwide have the honor of presenting an unprecedented collection of original stories, pin-ups, and strips dedicated to the character's creation in Peanuts: A Tribute to Charles M. Schulz. This 11.5” x 9” hardcover features 128 pages of full-color illustrations and comics from 40 renowned cartoonists, presenting the Peanuts gang in their own signature styles in a very rare opportunity and in cooperation with the Schulz estate. 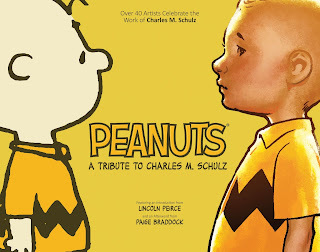 Mo Willems, Raina Telgemeier, Jen Wang, Patrick McDonnell, Stan Sakai, Terry Moore, Liz Prince, Mike Allred, Paul Pope and many more celebrate their love of Peanuts in this one-of-a-kind collection. The Peanuts: A Tribute to Charles M. Schulz hardcover arrives in comic shops on October 14th and in bookstores October 20th for the price of $34.99 under Diamond order code JUL151095 and ISBN 978-1-60886-714-1. The Final Order Cutoff deadline for comic shop retailers is September 28th. September 16, 2015 (Los Angeles, Calif.) - On October 2, 1950, good ol’ Charlie Brown made his first appearance in a classic, four-panel comic strip printed in seven newspapers nationwide. In the 65 years since, Charlie Brown and his friends have become household names around the world—and in Snoopy’s case, on the moon—appearing on television, on the stage, and in theaters. Charles M. Schulz’s creation has been awarded high honors and praise, and most importantly, the Peanuts gang has touched the lives of generations and continues to delight and inspire to this day. This October, KaBOOM!, an imprint of award-winning publisher BOOM! 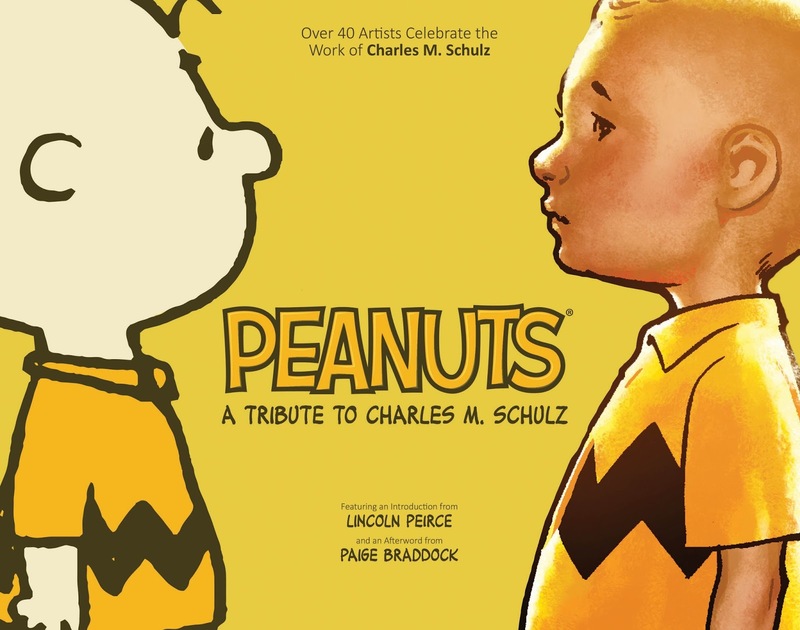 Studios, Charles M. Schulz Creative Associates, and Peanuts Worldwide have the honor of presenting an unprecedented collection of original stories, pin-ups, and strips dedicated to Charles M. Schulz’s beloved creation in Peanuts: A Tribute to Charles M. Schulz. This 11.5” x 9” hardcover features 128 pages of full-color illustrations and comics from 40 renowned cartoonists, presenting the Peanuts gang in their own signature styles in a very rare opportunity and in cooperation with the Schulz estate. Mo Willems (The Pigeon), Raina Telgemeier (Smile), Jen Wang (In Real Life), Patrick McDonnell (Mutts), Stan Sakai (Usagi Yojimbo), Terry Moore (Rachel Rising), Liz Prince (Tomboy), Mike Allred (Silver Surfer), Paul Pope (Battling Boy), and many more celebrate their love of Peanuts in this one-of-a-kind collection. The Peanuts: A Tribute to Charles M. Schulz hardcover arrives in comic shops on October 14th and in bookstores October 20th for the price of $34.99 under Diamond order code JUL151095 and ISBN 978-1-60886-714-1. The Final Order Cutoff deadline for comic shop retailers is September 28th. Not sure where to find your nearest one? Use comicshoplocator.com or findacomicshop.com to find one! It’s also available for order directly from boom-studios.com. Founded by Ross Richie in 2005, Diamond Gem Award-winning “Best Publisher” BOOM! Studios (boom-studios.com) generates a constellation of best-selling Eisner and Harvey Award-winning original and licensed comic books and graphic novels with the industry’s top talent. BOOM! Studios is comprised of four distinct imprints. The original Studios imprint is home to titles like Suicide Risk, The Woods, Irredeemable, Sons of Anarchy, and Big Trouble in Little China. 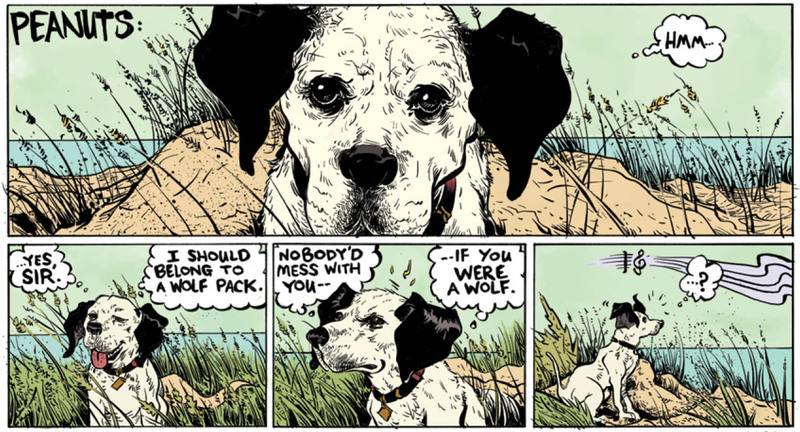 Steven Grant’s graphic novel 2 Guns was released as a feature film from Universal Pictures, starring Denzel Washington and Mark Wahlberg. BOOM!’s all-ages imprint KaBOOM! publishes Charles Schulz’ Peanuts; Jim Davis’ Garfield; Cartoon Network’s Adventure Time, Regular Show, The Amazing World of Gumball, and Steven Universe; Mike Kunkel’s Herobear and the Kid; and Natasha Allegri's Bee and PuppyCat. BOOM! 's experimental imprint BOOM! Box publishes The Midas Flesh and Lumberjanes. In June 2013, BOOM! acquired Archaia Entertainment. Archaia is the Eisner and Harvey Award-winning graphic novel publisher of Mouse Guard, Cow Boy, Gunnerkrigg Court, Rust, and Jim Henson’s Tale of Sand. In October 2013, BOOM! Studios entered into a unique first-look relationship with 20th Century Fox, giving the studio access to its library of titles and giving the publisher access to Fox's vast catalog of films. In August 2014, BOOM! Studios began a similar first-look relationship with 20th Century Fox TV to develop properties for the small screen.